If you are familiar with the electric griddle, you may agree how handy, convenient and user-friendly an appliance it is for your kitchen. You can cook your favourite dishes on the stove, but using an electric griddle has a few advantages over the stovetop cooking arrangement, especially if you are making some pancakes, French toasts, tortillas and many such savoury recipes for yourself or for family and friends. Firstly, a griddle is more likely to allow for a larger cooking surface than your pots and pans that can be used on a stovetop. Secondly, the even heating feature of an e-griddle can uniformly cook your food across the entire surface. The temperature control makes it increasingly convenient to cook as desired. While you can undoubtedly enjoy tossing up variant meals on your electric griddle, it may pleasantly amaze you to know that these e-griddles can be used for outdoor cooking too. Yes, whether on the move, camping or enjoying a picnic with your family, all you need is a place to plug this portable sleek designed appliance and churn out some lip-smacking food from your e-griddle. While there are several types of electrical griddles available in the market for camping purposes, here we discuss some of the best rated products that can serve you the dual purpose of camping as well as kitchen cooking. This sleek black 22-inch Presto e-griddle features a premium non-stick cooking surface that enables easy and clean cooking. The heat control plug (Control Master) connects the griddle to the outlet and helps in maintaining the desired cooking temperature as set on the dial. Moreover, with the removable control master your entire griddle can be immersed into water for cleaning and is dishwasher safe too. The slide out drip tray can be easily detached and cleaned separately as required. Its removable handles enable its compact storage. The handles that are connected with the legs are located on either side of the griddle base and can be detached by simply opening the latch clips. The cooking surface of the Presto 07061 22-inch Electric Griddle features as premium texture enabling enhanced non-stick performance. The textured surface of this e-griddle, unlike in other models designed with smooth surfaces, guarantees a stick free cooking experience and easy cleaning of the surface. The temperature knob of this product can be easily accessed allowing users to cook different types of food recipes in the base. The cord ensures durability and maintains a steady electricity flow to the e-griddle. The knob is located near the electric plug in this model. Warranty: comes with one-year limited warranty. Replacement parts can be ordered online as well. Sturdy: The tight springs that come with the product keeps the handles secure and the rubber sole affixed underneath its legs facilitate the appliance to stay in its place without tripping or falling. Price: this product is worth a buy as the price is in budget. With its outstanding features, removable handles, a large cooking surface area and easy storage, the Presto 07061 22-inch Electric Griddle is certainly a reasonable choice for having in your kitchen. The lightweight and removable handles enable you to carry this compact e-griddle to enjoy your camping meal times. If you wish to prepare some low fat healthy meals, the MaxiMatic EGL-3450GD Elite Cuisine 13-Inch Countertop Non-Stick Electric Indoor Grill is a great electric griddle choice to make. Featuring a drip tray that allows for draining out excess fat generated by the food being cooked, this non-stick surface could become the most reliable appliance for the health conscious individuals. Additionally, the thermostat control allows for setting precise temperature so that you can have greater control over the cooking process. Removable thermostat control: This feature allows for adjusting the temperature anywhere between the available limits for precise and desirable cooking. In this case the temperature can be set between 195°F to 445° F.
Detachable power cord: The power cord in this model is detachable allowing for easy and safe storage. Moreover, this model of electric griddle can be carried along for camping too without the fear of cord being damaged. Cool touch exterior: The cool touch safety handles enable safe use as it reduces chances of burning hands in case of contact with the handles when cooking is on. Drip tray: The drip-tray is both removable and dishwasher safe. Compact: MaxiMatic EGL-3450GD Elite Cuisine is portable and can be carried outdoors too for an RV and camping. This e-griddle will not disappoint you in terms of heating, as it heats up quickly. The temperature settings enable even cooking. The flat cooking plate allows for quick and uniform heating. Cook healthy low fat meals for your family easily on its non-stick surface to make cooking an enjoyable and hassle free experience with this product. It’s one of the most affordable electric griddles that you can purchase. With the Oster CKSTGRFM18W-ECO DuraCeramic Griddle, you can roll out some delicious recipes. This countertop griddle that can be easily carried outdoors as well is designed with unique Titanium infused non-stick ceramic coating that enables greater longevity than most other ordinary non-stick surfaces. The large surface area of 10″ x 18″ allows for preparing sizeable meal portions. The super hard and extra durable surface makes this model of e-griddle almost warp free. The appliance is extremely efficient as it can cook nearly 30% faster and save cooking time. The convenient warming tray that comes with this electric griddle is ideal for keeping and serving food at a desirable temperature. The Oster CKSTGRFM18W-ECO DuraCeramic Griddle is an innovative electric griddle model featuring a host of useful functions. This model is enabled with two trays serving distinct purposes: the griddle tray and the warming tray. The warming tray is effective as it keeps the food fresh for a longer duration of time. The griddle tray is embodied with a high-quality coating and material that can withstand high temperatures. The appliance features various control options where the temperature can be regulated enabling custom heating and high-quality performance. The sleek design of the product makes it convenient for carrying it for camping too. Comes with a warranty of 1 year and is available in both charcoal black and crème colour. Pricing: this compact and portable appliance is reasonably priced against the great features it comes with. The appliance is free from PTFE and PFOA chemicals allowing healthy cooking and the extra durable surface restricts the surface from flaking or chipping easily. The surface allows plenty of space for preparing batches and variety of recipes. Many users complain about its uneven heating stating that it does not reach to the sides of the griddle surface, leaving the food by the edge unevenly cooked. Price is slightly on the higher side as compared to its counterparts available in the market. Overall this ergonomically designed appliance is a great buy with its promising durability. If you’ve been looking for an innovative griddle with dual functions, the Hamilton Beach 38546 can make for a great choice. 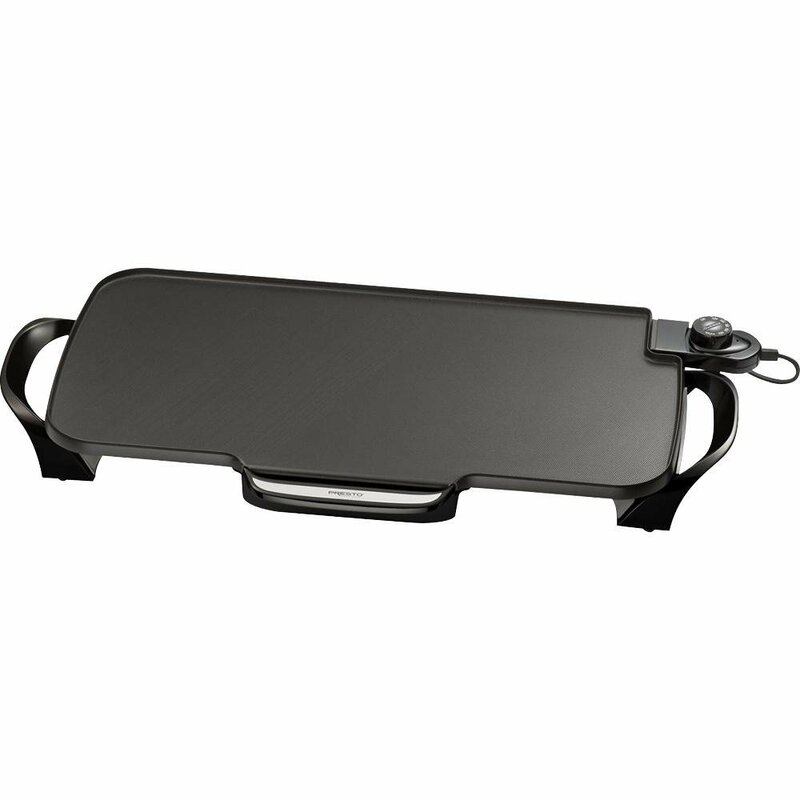 This electric griddle can be used both as a grill pan and a griddle pan. Additionally, the heating surfaces of these non-stick pans are divided into two to enable multiple food cooking. They are also designed with high quality material resistant to a range of temperature. This handy electric appliance has double independent temperature control features that can be accessed separately. This unique feature enables the user to cook two varieties of food simultaneously at desired temperatures. The griddle and the grilling functions can be used together. Moreover, there are two LED lights around the two temperature knobs that are effective in indicating the temperature. A drip tray and centre grease channel withholds the excess oil and fat within the cooking base enabling clean and efficient cooking. Care and cleaning: Can be wiped clean and comes with removable dishwasher safe parts. The grease channel and removable grease tray are easy to clean and dishwasher safe. Despite its 3 in 1 feature, this electric griddle is slightly over-priced its prototypes available in the market. Storage can be an issue as the product is big and may take a considerable space in the kitchen cabinet. The Hamilton Beach 38546 3-in-1 Grill/Griddle is an amazing combo appliance that gives optimal flexibility. Though you may need to use a cooking spray to avoid the food from sticking onto the grill base, the easily dishwasher friendly removal panels makes cleaning effortless. Overall, it is an efficient product, especially if you enjoy cooking a variety of savoury meals. If you are looking for an extra-large cooking surface area, then this model from Presto is can make for an ideal electric griddle for your kitchen. The expansive surface measuring 22” x 13” is built of durable and hard cast aluminium. Even with more space, the product manages to be light-weight yet rigid. With a non-stick cooking surface, you can make healthy meals with minimum oil and easily clean the griddle pan too. The appliance comes with removable handles and can be conveniently placed or stored in a safe place. The temperature control knobs are detachable allowing for swift and easy cleaning. Presto 07072 Slimline Griddle is durable with an almost warp proof surface. The large cooking surface, enabled with even heating across the entire griddle can be used for making a whole batch of your favourite breakfast meals and snacks. It can also be used as a small and handy buffet serving unit. With easily adjustable temperature controls and knobs, the appliance can be used to cook food with greater control over the cooking process. The removable temperature makes cleaning convenient with the additional benefit of immersing the whole appliance into water for thorough washing after removing the heat controls. The Control Master Technology maintains a consistent temperature on the surface for uniform heating. The product comes with a slide-out drip tray that can catch any extra oil and fat spilling over the griddle pan’s surface. Despite such top grade functional features, the product is budget friendly and worth a buy. The slim looking and portable product can be easily carried to the campsite to indulge in some fun and delicious cooking with friends and family. With just a supportive electrical connection you can enjoy outdoor as well as indoor cooking. With the above detailed features and specifications, you can surely find yourself better positioned to understand the benefits of possessing an electric griddle in your kitchen countertop. All the 5 griddles as mentioned above are top rated and enabled with some or the other unique feature. However, the best part is that you can carry any of these electric griddles wherever you go as they are typically sleek and lightweight and can make outdoor cooking hassle free and clean. With easily removable parts and effortless cleaning facility, you can use any of these models your high performing companion at outdoor parties, RV and camping.